Feb. 3, 10, 17, 24, Mar 3, 10, 17, 24, 31, Apr. 7, 14, 21, 28, May 5, 12, 19, 26 ...and weekly until the migration is completed! Monarch sightings continued to fly in last week but most were about observations that were made the week before. Most of the news came from Canada this week, the final nation on the monarch's international tri-national tour. Monarchs are now being seen in the nation's capital, by people who speak the third language a monarch might overhear, and by students across the land. How much father north will they travel? Our international network of observers added a record 166 monarchs to the map this week. Over half of the season’s sightings took place during one single week! The monarch population builds during the breeding season with each generation. When the monarchs migrate to Mexico next fall their numbers will be at their highest. What a week! The winds were finally right and the monarchs set sail. Jet stream patterns had kept north winds and cold temperturares in place for days. The migration's leading edge lags behind in the East. But the GRANDCHILDREN of the monarchs from Mexico are now being born. Let's see what happens in the week ahead. Monarchs have arrived at 45 degrees N! Sightings are still at a low, but this week brings a handful more. Some monarchs reported in good shape, others are faded from long journeys north. Will the monarchs flood northward in the next two weeks? Will the milkweed be ready for the females to lay their eggs? Come back next week for a full report. Another quiet week has passed. We predict the monarchs will flood northward in the next two weeks as more fresh butterflies emerge. Only 8 new sightings were reported, yet they include a mystery for you to solve. Have you ever watched a monarch butterfly emerge from its chrysalis? How does the monarch manage to get out of the tight chrysalis that surrounds it? The migration's leading edge has now advanced to 42N and the first butterflies have crossed into Canada! But, by the first of May each year, most of the millions of monarchs from Mexico have died. Today's map probably shows how far the monarchs from Mexico will travel this year. How long did they live and how far north did the farthest monarch travel? Everybody’s talking about early monarchs! A record early-sighting in Michigan put the leading edge of the migration at 42N last Friday. Where were the monarchs last year at this time? Look at the week-by-week migration maps from spring 2005 and 2006. Compare how far the migration had advanced each week. Describe how the migrations are similar and how they are different. But watch your language! The monarchs in the East have passed those in the Midwest. Are they coming up from Mexico? Monarchs are arriving just as the milkweed appears. This close timing concerns students in Cub Run, KY. "There are lots of flowers for a hungry monarch, but no milkweed for the babies." Watch a caterpillar feast in this video clip and you'll see why they worry! Also, compare and contrast the migrations of monarchs and hummingbirds, both are flower-powered migratory species. The migration's leading edge has now advanced to 39N, far beyond its position at 36N just one week ago. How many miles is that? And how many miles per day did it advance, on average? We now know that one female monarch can lay over 750 eggs. What happens to them all? Dr. Brower shares a fascinating observation, and speculates what drives female monarchs to migrate. Do ONLY females migrate, another scientist wonders. The migration surged ahead last week exactly as predicted, and the leading edge is now approaching 36N. The first fresh, new monarchs sighted in Arkansas say the next generation has begun to appear. These new monarchs will continue the journey north in place of their parents. Meanwhile, the egg-count from Arkansas’ Ms. Monarch now stands at 708! Speaking of eggs, what’s the most interesting thing Dr. Brower knows about them? Strong south winds on a hot humid day did it: "The Monarchs are now in Oklahoma!" proclaimed an observer there. The cold air parked over the eastern US for a full week, affected hummingbirds as well as monarchs. Compare the animated maps in today's update and explore how weather and migration are related. Also Ms. Monarch is back, after just having laid her 551st egg. Predict when her first child will become an adult. After a very unusual winter, an unusual migration pattern is appearing. Look at the East Coast! Monarchs are appearing on the map out of order, at least according to every science book ever written. Also, do you know how many eggs a single can monarch lay? With the gracious help of Dr. Jim Edson, Ms. Monarch will be our volunteer. Check out her egg-laying calendar so far, then send your prediction. As you will read today, millions upon millions of monarchs are coming your way! Within days the monarchs are vacating the colonies in Mexico. "I'm amazed by how quickly they departed!" said Dr. Lincoln Brower. How far have the monarchs traveled so far? What will happen next? It's time to make your first weekly predictions. Also: Why should we care about monarchs? Over 100 people sent their ideas. Are you ready to be inspired? Read on! They’re on their way! Monarchs streamed through town by the millions, flying north from the overwintering sites in Mexico. Reports arrived from the Mexican states of Queretaro and Guanajuato, too--and even from central Texas. Spring monarch migration is officially underway! But look at this map of winter monarch sightings and read a story about an amazing discovery in Virginia. Why are so many monarchs so far north so early in the spring? This promises to be a fascinating spring migration. How many monarchs are in Mexico this year? The news is in! Scientists say this year’s population is almost three times larger than last year’s. Like a snapshot in time, they estimate the size of the entire overwintering population each winter. But how do the scientists make these estimates? Look carefully at their methods. Then try your skill at this challenging task! Also, Dr. Bill Calvert reports from Mexico that the colonies have begun to break up. Why does this happen every year at this time? 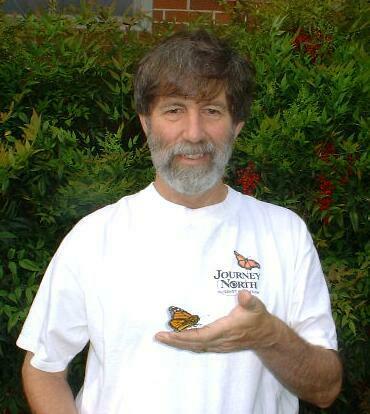 Dr. Bill Calvert was one of the first biologists to study the monarchs at their over-wintering sites in Mexico. For the next three weeks he will be our special telephone tour guide. "A river of monarchs streaming down from the mountains greeted us," he began. Why were so many butterflies flying on Tuesday? This week, we also look at water in the winter habitat. We consider the theory that monarchs can survive without food and how scientist know what they know. Monarchs can survive the 5-month winter eating little or no food at all. "Because their bodies slow down," says Gaby, a 2nd grade student, just like an expert. Learn about cold-blooded creatures this week. Then consider the impossibility of 50 million monarchs finding flowers in their winter habitat. Brrrr...It can be cold in Mexico! Most people assume the monarchs fly to Mexico to spend the winter in a place that is warm. Last week we saw pictures of people wearing hats and mittens there. Why is it so cold? The monarch's mountains are nearly two miles high. Explore how elevation and temperature are related, and why temperature conditions are key to monarch survival. Welcome to Journey North's spring monarch migration season! We begin each year while the monarchs are still at the overwintering sites, deep in central Mexico. The monarch’s story of survival during the winter months in Mexico is as spectacular as their incredible migration. During the coming weeks, we’ll look at the monarch’s winter habitat, and the adaptations monarchs have for survival. Copyright 1997-2006 Journey North. All Rights Reserved.